Senator Fasano explains the Senate Republican budget revisions at a press conference at the state Capitol on May 16. 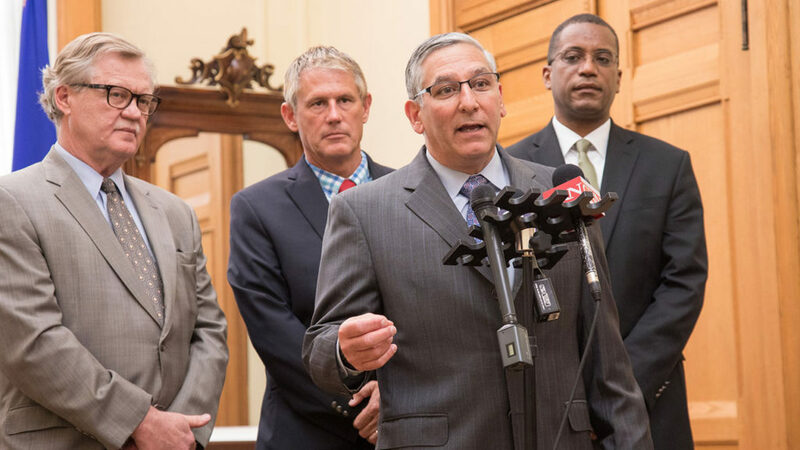 This week Senate Republican President Pro Tempore Len Fasano (R-North Haven) and Senate Republican lawmakers released a revised line-by-line state budget proposal that does not rely on new taxes. The revised two-year budget addresses the dramatic revenue drop reported at the end of April which leaves our state with a budget shortfall of nearly $5 billion. “Tough decisions had to be made to close a devastating shortfall in the budget. We are proud to offer a complete budget proposal that continues to protect municipalities, provide funding for core social services, support our state’s transportation needs, and increase funding for education to towns and cities across the state. We protect hospitals from being hit with more taxes and we protect taxpayers from being overburdened by new taxes or policies that would result in significant increases to property taxes,” said Sen. Fasano. A full summary of the updated “Confident Connecticut” budget is available here. Line-by-line details available at www.ctsenaterepublicans.com.